Reading and share top 6 famous quotes and sayings about Napoleon Bonaparte by famous authors and people. 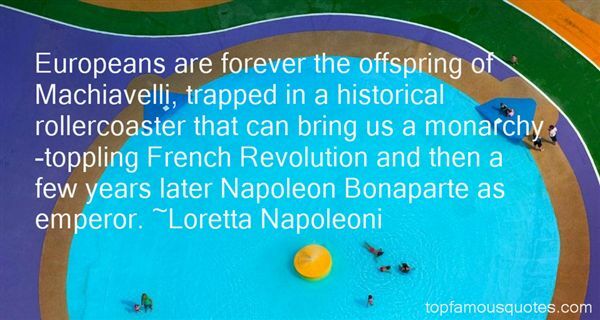 Browse top 6 famous quotes and sayings about Napoleon Bonaparte by most favorite authors. 1. "[Wise men] have tried to understand our state of being, by grasping at its stars, or its arts, or its economics. 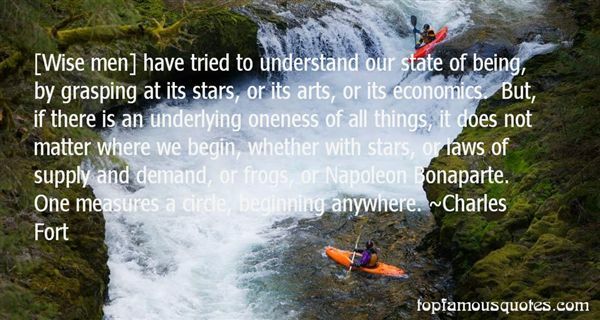 But, if there is an underlying oneness of all things, it does not matter where we begin, whether with stars, or laws of supply and demand, or frogs, or Napoleon Bonaparte. One measures a circle, beginning anywhere." 2. "Life meanwhile, the actual life of men with their real interests of health and sickness, labour and rest, with their interests of thought, science, poetry, music, love, affection, hatred, passion, went its way, as always, independently, apart from the political amity or enmity of Napoleon Bonaparte, and apart from all possible reforms." 3. "Europeans are forever the offspring of Machiavelli, trapped in a historical rollercoaster that can bring us a monarchy-toppling French Revolution and then a few years later Napoleon Bonaparte as emperor." 4. "This soldier, I realized, must have had friends at home and in his regiment; yet he lay there deserted by all except his dog. I looked on, unmoved, at battles which decided the future of nations. Tearless, I had given orders which brought death to thousands. Yet here I was stirred, profoundly stirred, stirred to tears. And by what? By the grief of one dog.Napoleon Bonaparte, on finding a dog beside the body of his dead master, licking his face and howling, on a moonlit field after a battle. Napoleon was haunted by this scene until his own death." 5. "Because if the whole universe could just explode out of Nothing and then just Be, don't you see that the opposite could also be true? That it is possible to implode and Un-Be as well as to explode and Be? That it's possible to implode and Un-Be as well as to explode and Be? That all human beings, Napoleon Bonaparte, for example, or the emperor Akbar, or Angelina Jolie or your father, could simply return to Nothing once they're...done? In a sort of Little, by which I mean personal, Un-Bang?" 6. "Neurotics, proceed with delusions of grandeur. Napoleon Bonaparte, take the lead. Jesus Christ, bring up the rear. Simulate severe depression. Non-communicative with repressed hostility."